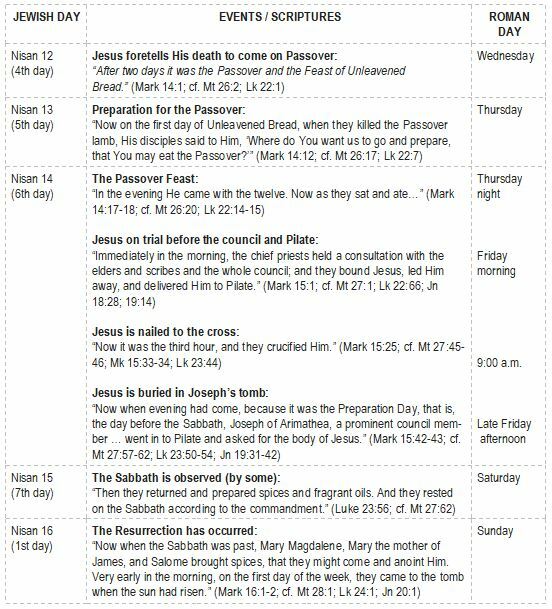 A careful analysis of the four accounts of Jesus’ death, burial and resurrection enables us to know the days on which these events occurred, and to see that indeed, Jesus was in the tomb for “…three days and three nights…” (Matthew 12:40) as He foretold. Upon looking at the texts, we can clearly see a succession of five consecutive days, the first of these being Nisan 12 of the Jewish calendar, and the last being the “…first day of the week…” or as is more commonly called today, Sunday. Note, the Jewish day is calculated from sunset to sunset (approx. 6 p.m. to 6 a.m.), whereas the Roman day is calculated from midnight to midnight. The time spent by Jesus in the tomb is described several different ways (three days and three nights, on the third day, in three days, after three days, until the third day, three days later, the third day, see Matthew 12:40; 16:21; 17:23; 26:61, 63, 64; 27:40, 64; Mark 9:31; 10:34; Luke 18:33; 24:21). These are all used interchangeably. The question is whether it demands a literal 72 hours or merely parts of three days and three nights. Now, let’s look at the 5 consecutive days the Scriptures show us, beginning at Nisan 12, and ending with the first day of the week. We will use Mark’s gospel as our base text, but notice how the other gospels supply substantial support to the chronology. This entry was posted in Jesus, Uncategorized. Bookmark the permalink.